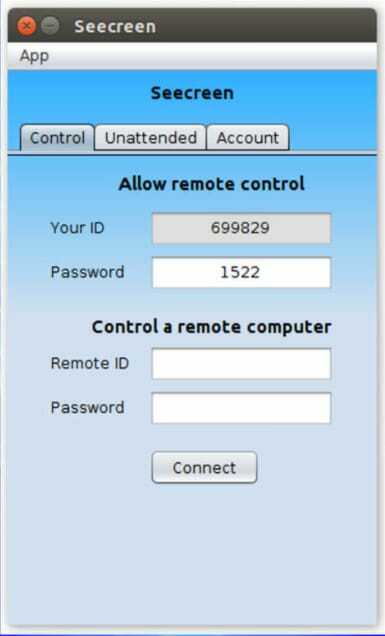 Controlling a computer from another can be done with the help of special remote access software. There are many situations when this could be useful, particularly when it comes to resolving computer problems or for remote administration. These programs allow you to take complete remote control of the connected computer as if it’s your own. You can even use peripherals such as mice and keyboards. What’s great about these applications is that you aren’t restricted by a network or a physical location. Accessing computers remotely this way can be done from virtually anywhere. Even though corporate help desks are the primary beneficiaries, regular users can also take advantage of the remarkable potential of remote access software. In most cases, to start a remote control process, there’s a little set-up involved. You will first need to install software on the host computer, the one you wish to access remotely. After this process is finished, other devices will be able to connect to the host if they have the correct credentials. The computer that takes over the host to control it is also known as the ‘client’. Security is an obvious concern when using a remote access software and not all applications on this list handle your safety in the same way. Some are stricter in this regard as they don’t just allow access immediately or without careful configuration of access rights. You have options for typing passwords multiple times and will sometimes require email verification when doing important things. All the programs should give you a certain degree of customizability when it comes to security, so it all comes down to your preferences. Although that may appear complicated initially, remote access utilities are very easy to use. There’s no need to get lost in technical aspects as most programs don’t require you to have advanced computer knowledge. In just a few clicks you can start accessing another computer remotely. 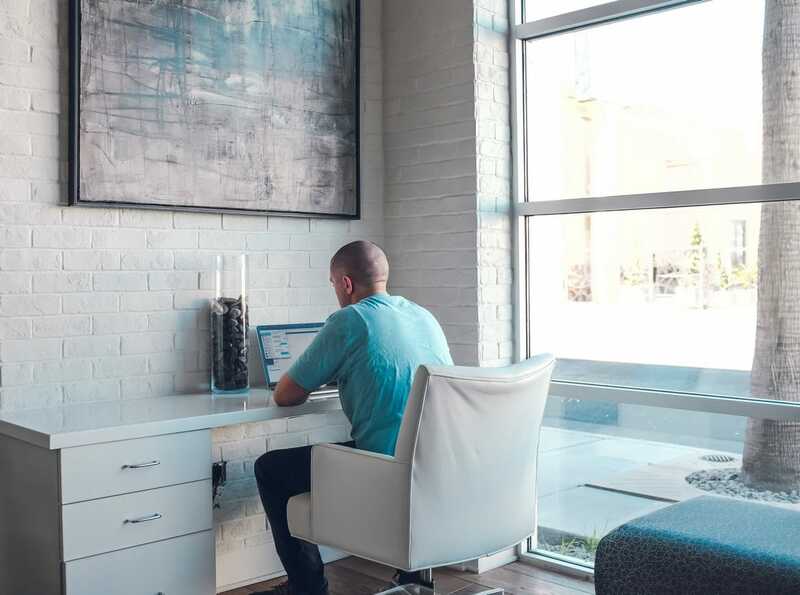 If you feel like a remote access software would be extremely useful for your needs, check out the following programs that can handle the job without costing you anything. One of the best tools in the world of remote access software comes from Teamviewer. Their free version has a very generous amount of features and is very simple to install and configure. We particularly like the fact that it doesn’t require router or firewall modifications to work as intended. Teamviewer is available for pretty much all the major PC and mobile platforms. It’s difficult to match its selection of features considering that it’s free. One thing to keep in mind before detailing its abilities is that it’s only free for personal use. It has a way to detect commercial use and can stop working in that situation. With every install of this software, there’s a unique ID number provided that helps to identify the current computer. Even if you reinstall the application, this ID number will stay the same because it’s important when it comes to sharing it with another user for remote access. There are different versions of this remote access software, but the best one to install is the ‘All-In-One’ version. It packs the full selection of features and is the one to use for unattended access. This means you can configure a PC for constant remote access enabling the user to connect while he’s far from it. Another version of TeamViewer to consider is QuickSupport, which has the bonus ability of enhanced portability. You can use it more quickly to get a shareable ID number for someone else while skipping the waiting times. This is the fastest way to use the software if you’re in a hurry and the ideal version to try when you’re helping out your relatives with a technical problem. One aspect we really like about this software is the flexibility. You can easily connect from computers with a TeamViewer version to PCs with different versions of the program, so there are no compatibility issues in that sense. Both QuickSupport and All-In-One editions will enable remote connections to be made. If you plan on setting up unattended access, the simplest way to do it is to create a master password which doesn’t ever change. You can easily connect to your computer when you’re going away and once this password has been set, all that’s required is to log in to your account. This can be done from any browser including mobile devices. One advantage of this remote access software is the ability to view the screen of iOS devices. This could be really helpful as not all similar programs come with this feature. To do this, you simply need to install the QuickSupport version on your iPhone or iPad and then activate screen recording. To keep track of your remote sessions, this application gives you the option to record video files for each session. Store these files and access them whenever you wish to review your remote sessions. There are many interesting customization features you can benefit from. A good example is how you can share only a particular application window, as opposed to giving clients access to the full desktop. For transferring all kinds of files, the software offers a dedicated tool which allows convenient sharing of text, images, or even entire folders. Two computers can also interact in this regard with the help of the simple clipboard function. If you prefer, there’s even the option of adding files from cloud services like Google Drive which can be sent through the software. 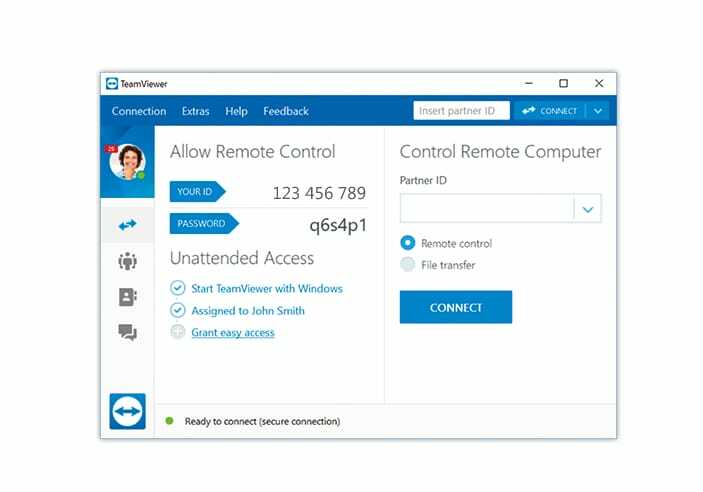 As you only need to share the ID and password and don’t have to bother setting up port forwards, TeamViewer is by far one of the most user-friendly remote access programs you can use for free. The browser version may be less intuitive, but all in all, this software is highly recommended considering the multiple remote access possibilities. AeroAdmin represents a high-quality solution for all your remote access needs. This is a portable free application designed for Windows systems and, even if it doesn’t boast as many features as TeamViewer, it does have an important advantage over it. You can count on this software whether you’re using it for yourself or in commercial settings. This is a very lightweight program considering its reduced size. In less than a minute you can have it up and running, which is always a great feature to have for any remote access software. There is no integrated chat feature and the free license has some restrictions in terms of connection time, but these are the only drawbacks to be aware of. The remote control software works flawlessly with all the recent Windows versions including both 32-bit and 64-bit editions. That’s not all though, as the program is also compatible with some older operating systems such as Windows Server 2008 and 2003. Like TeamViewer, this application won’t ask you for any router changes which makes the configuration process a breeze. Because the program is portable, you can have the additional benefit of being able to run it from a portable drive. There’s an ID number which you can view in the application and that’s the most important information to make the connection with another computer. If you’d like to, there’s also the option to use your computer’s IP address instead of this number. When a connection is made initially, there are a few things that need to be done on the host side. You have to give permission for the client computer to access your screen and for other important aspects such as keyboard and mouse control. The host computer can always revoke any right to maintain the right safety level. A good convenience feature is the ability of the host to memorize the options you select when giving access rights to your client. Basically, you won’t need to do this every time the connection is made with that computer. It’s not required to go through those same prompts and configuration settings again. You’ve got three options for connecting the host to the client according to the level of control you enable as the host. For example, you can just enter the ‘View only’ option. After you’ve made your selection, you can’t simply switch to another. Exiting and reconnecting is mandatory for this process. The main strength of this remote access software lies in its minimal design. The file transfer wizard is another important feature of this program. It’s designed to give full control to the sender when transferring files. It’s so easy to use that even novices should have no issues with it. Anyone can start a remote session in just a few quick steps with such a handy program like AeroAdmin. Taking into account this intuitiveness and all the other features, it can be safely said that this remote access software deserves a top spot on this list. With many attractive abilities such as unattended access and file transferring, AnyDesk comes next on our list of free remote access programs. One of its stand-out features is the organization of the browsing experience. You can hide some menus and customize the look to make it easier to use. In terms of operating systems, this software isn’t limited to just Windows or macOS. It provides support for Linux, Raspberry Pi, and mobile platforms such as Android and iOS. Like most other similar tools, this program relies on an ID number for creating the necessary connection to another device. You can use either a desktop program that requires installation or you may choose to run the portable application. The installed version has a bonus feature as it allows you to define a custom alias that’s associated with your ID number. This can be helpful because it’s much easier to remember a username compared to memorizing random numbers. Connections can be established quickly and efficiently by sharing AnyDesk addresses from the host to the client computer. The one who shares is always the host. For unattended access, you will need to create a password from the program’s settings. There are other aspects you can manage from the settings. For example, you can set the permissions you enable for clients that connect to your computer. Some of the most relevant rights are for viewing the monitor, controlling peripherals such as the mouse or hearing the sound of the computer. The interface of the program doesn’t feel cluttered which is pleasing to the eyes. The clean aspect is probably due to the way the program is designed to be very lightweight. Despite this look, there are lots of customization features to take advantage of. One essential feature for a remote access software is the ability to transfer files without too much hassle. This application comes with a clipboard syncing feature in that regard, but if that’s too limited, you can also install a separate tool which is used just for file managing. Remote session recording is another available feature of this program. To access certain connection more quickly, there’s the option to save shortcuts on your desktop. Another handy ability is to give control to the other side if needed, something that can be achieved even during a remote session. 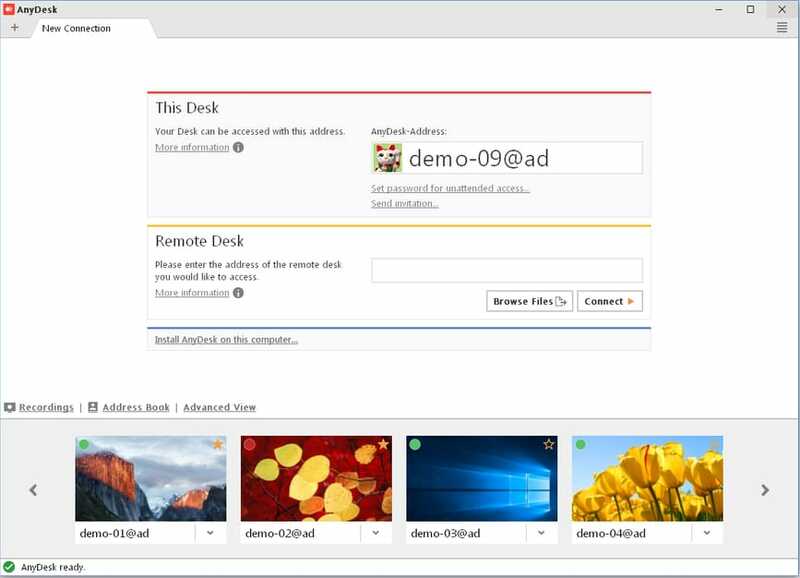 Considering how AnyDesk delivers a solid remote access experience offering both unattended and on-demand types of access, the final conclusion is very positive. There’s no port-forwarding required, you can use the file transfer tool and all the other features of the software for free. This is a great remote access solution. A capable remote access program to try for free is DesktopNow from NCH Software. This little tool enables quick access to your data over the internet. It may require for you to configure the router beforehand as well as the creation of a free account, but you can quickly deal with these and start managing your computer via a convenient web browser from anywhere. To begin the remote access process, the first step is to install the application. Assuming you’ve made an account, enter your credentials at the initial launch of the program and then go over to the client device to establish the connection. Just enter the same email and password you’ve used on the host computer to finish the process. There’s a solution to avoid complicated port forwarding. You can choose cloud access when installing the application which allows for a more direct connection. In fact, this is the recommended option for most people. If you’re not really sure how to configure the router, it’s best to leave it as it is. Things get really simple from now on. The client can use any web browser to gain access to the computer host. Those who went with the cloud access approach will only need to use the provided link. With the finished connection, the only remaining question is what are the things you can do with this remote access software? One of the most important features is the ability to download files from the host. This could be extra helpful if you’re somewhere in a meeting and you forgot to transfer your presentation from the home computer, but that’s just an example. There are lots of possibilities when you consider the transfer options available through this remote access program. When it comes to security, this software seems to get things right. It does provide complete access through any browser, but it permits the use of secure SSL connections for safe data access. This program is compatible with all the recent Windows versions including Windows 10 and 8. The file explorer browsing is designed with user-friendliness in mind so you can quickly retrieve any needed files or upload others. Even though there’s no dedicated app, the browsing experience is satisfactory on mobile thanks to the optimized interface for portable devices. You can also easily interact with an installed program on your PC. While not as full-featured as some other options on this list, the DesktopNow tool could be considered a strong candidate if you’re searching for a reliable remote access software. It’s designed to accomplish a fairly basic task, and it looks like it’s able to work as expected while keeping things simple and without any frills. 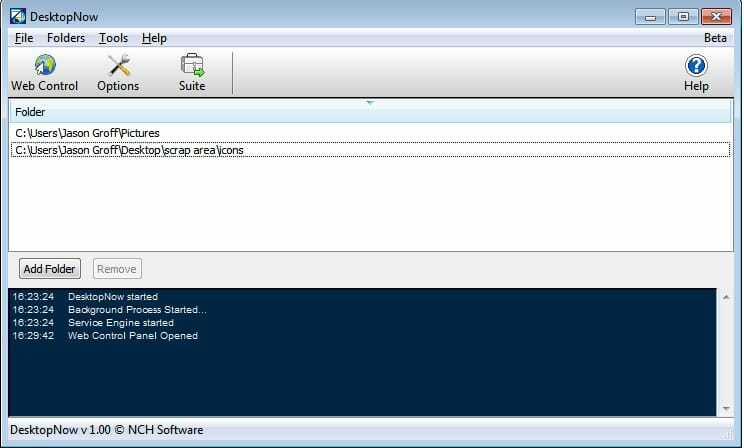 RemotePC is another remote access software that’s worth taking a closer look at. It boasts some advanced capabilities for a free program and it provides support for both Windows and Mac users. Remote connections can be done using mobile devices too, so let’s see what this program has in store for those who need convenient remote access. The first interesting aspect regarding this software is the way it’s designed with a minimal footprint. There aren’t any extra tools you need or other confusing utilities that you have to use on top of an existing program. All you need is the same RemotePC program on both computers to make the connection. With that being said, this application can be used in two main ways. One method is the Always-ON remote access. For this, you will need to create a brand new user account which is done quickly and will prove very helpful to manage your connection. This method represents an ideal solution if you plan on obtaining permanent access to your own machine when you’re not at the desk. Before we check out the other way to establish remote access, let’s better understand the Always-ON method. Configuring this is pretty easy once you choose to set everything up from the Always-ON area of the program. The computer requires a password, a recognizable key which will be needed for later access. With the password set, the only thing left to do is to go to your other device and log in to the same software there. Find your host computer list and enter your password. It doesn’t get any simpler than this, maybe just a little faster. Let’s see the other way to access your computer remotely which can speed things up. The second method is the one used for instant access. It’s called One-Time access and you can find the option in the program and enable it from there. You will get a generated access ID and password which you offer to the person connecting to you. Then it’s simply a matter of entering these credentials into the ‘Connect using One-Time ID’ section of the program on their system. When a One-Time remote session is finished, simply press the dedicated button for disabling access. The other person won’t be able to reconnect to your computer unless you restart the process and give him a new password. Essentially, the initial password will be revoked. RemotePC seems quite easy to use, but what about its included features? There’s a file transfer ability which is important to have in this type of application. One thing we like about the transferring tool is the way you can use it separately from the main program as it doesn’t require opening the full control screen of the remote program. In terms of limitations, this remote access software does come with a restriction which is to be expected for a free program. It only supports storing a single PC’s information. More than this will require you to pay, but that doesn’t sound too bad. Most people shouldn’t have an issue with this as their needs can be covered in a satisfying manner. By the way, this limitation for one computer is just for users of the first method – the Always-ON remote access. If you want spontaneous One-Time access, there are no restrictions as you can go through this process as many times as you like for multiple PCs. 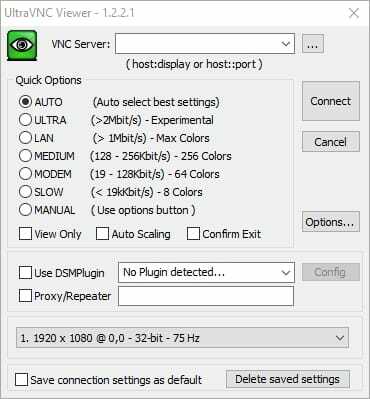 All things considered, RemotePC does a solid job as a free remote access software and deserves some more attention if you need to use this kind of tool. It’s nice to see an integrated chat feature as well as the reliable file transferring capabilities. 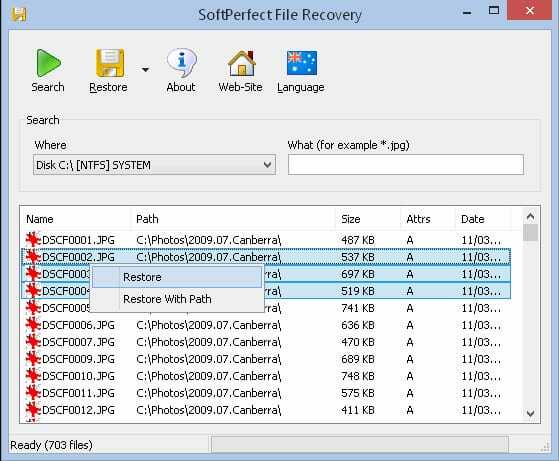 Whether it’s unattended or instant remote access, this free software is highly recommended. Anyone who’s looking to use a more advanced remote access software should try out UltraVNC. This program is equipped with more customization options besides the usual basic features that you’d expect in this type of program such as file transferring and chatting. This utility supports any Windows version from XP to Windows 10 and extends its compatibility to Windows Server 2012 and older. The way UltraVNC works is straightforward, but a bit more complicated for certain users. That still makes it a worthy candidate. The connection is established through a client/server, similarly to the operation mode of other remote access applications. The Server version needs to be installed on the PC that acts as ‘client’ while the Viewer edition has to be installed on the one that’s considered the ‘host’. The thing with this application is that it will require port forwarding configuration for the server to be able to receive incoming connections. In that regard, you will have to go through some extra steps to create a static IP address. There are some guides online to help you with that as this goes slightly beyond the scope of this review. 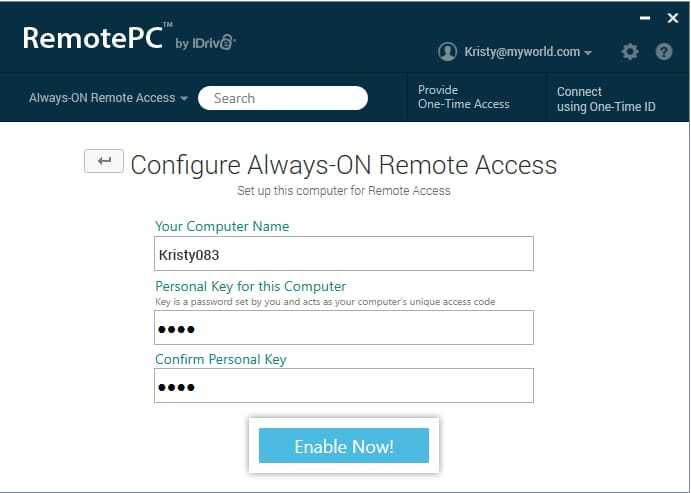 Those who wish for complete and convenient access to their home PC while on-the-go will definitely appreciate the functionality of this remote access tool. With all the right configurations done, there’s plenty to do, including transferring various files or opening programs. As the port forwarding changes are a necessity to get this remote access software to work as intended, it’s not really recommended to rely on it for remote support. It’s certainly doable, but less practical as you’ll probably spend too much time with the configuration process. This could be particularly detrimental when you already have issues with the host computer. Some advanced features of this software are the custom encoding options, cursor tracking, and powerful file transfer capability. These are especially great for remote access, and that is why it’s recommended mostly for that instead of remote support. There are many hidden features you can discover during use. A good example is the ability to save your current session to a dedicated file that can be opened afterward by the program to resume your work. This becomes particularly handy when you’re using the application to connect to multiple computers. Just save shortcut files for faster access. If for any reason, you cannot install software on your PC, there’s also the possibility to use a browser to establish connectivity to the server. You don’t necessarily have to use the UltraVNC Viewer application itself. Overall, this little piece of software can be very handy as a remote access solution. Just don’t count on it if you wish to help your friend with his computer issues. Even though it’s not the most intuitive remote access program out there, UltraVNC earns a spot on this list considering its more advanced capabilities. One impressive remote access software to take into account is Remote Utilities. This free program allows you to establish up to 10 computer connections at no cost, and that can be achieved either through the computer program or by using a mobile device. As its name implies, there are multiple utilities to facilitate remote access. Understanding the way this tool operates shouldn’t be very difficult. The basic concept found in similar software is once again available as Remote Utilities enables the pairing of a host with a client computer. There are different applications designed for each separate role. And so, you’ve got the special software for the host and a dedicated one for the client. The host software comes in two versions. First, there’s the conventional installer version which does what you’d expect – it installs the software on your PC. The other version to be aware of is the one called ‘Agent’ which has been designed for quicker connections as it runs without the need for an installation. The initial setup for the host software includes creating a password. This is the first step and definitely an essential one for preventing unauthorized access to your PC. To access the host computer, you’ll need to provide this password to the client so he can enter it into its Viewer version of the program. Next, the host computer needs to access some settings to create a special ID code which the client’s software requires to gain access to the host. The client is now able to establish the connection using the generated credentials from the host computer. Keep in mind that you also have the option, as a client, to use a portable version of the Viewer program. The interface of Remote Utilities deserves a special mention. It’s quite intuitive, ideal even for less experienced users. The only step that could be somewhat considered more difficult is when you’re configuring the security options on the host software. Aside from that, all the tools are designed to work smoothly. There are helpful options to change according to the situation at hand. For example, you can toggle between two viewing modes when looking at the remote screen. Sometimes, it’s preferable to simply watch what the host is doing without yet intervening. Other times, the full control mode works best. When it comes to transferring files, this application has a good utility for that purpose. It’s designed to meet the needs of those in a hurry so it wastes no time on confirmation prompts. The file transfer utility can be conveniently opened and used without even looking at the remote screen. That could be very useful when you’re in the Viewer program. Another decent feature which comes as an added bonus is the Inventory Manager. This shows you some relevant information about the host computer, and the level of detail is quite good. You can easily see the operating system and installed software, but not just that. There’s also the possibility to check things like version numbers for hardware or manufacturer details. Factoring in everything about Remote Utilities, including its capable mobile Viewer application, it becomes clear that you’re in good hands if you choose this free remote access software. One thing to be careful about is to select the ‘Free license’ option when you’re going through the installing process of the tool because otherwise, you’ll end up with a 30-day trial of the full version. The last free remote access software option we’ll look at is the Seecreen application which was formerly known as Firnass. This is a little portable tool created specifically to suit the needs of those who want on-demand remote access. Some features like clipboard syncing are lacking, but other more advanced abilities such as session recording can be found. The program works well on all the popular operating systems including Windows, Linux, and MacOS. One of the most striking resemblances to other remote access tools is the way the application has to be present simultaneously on the host computer and the client device. Therefore, you will have to install Seecreen on both computers you plan on connecting. It’s strongly recommended to create an account to fully take advantage of this remote access tool. When you open the application, you’ll be prompted to log in. Once you’re logged in, you can better monitor the possible connections. A handy Contact menu allows you to add users and there’s also a Computer section for adding computers you’ve previously logged onto. A Peer-to-Peer connection can be done once the other paired user appears online. There are many things to do from the main window. You can start a text chat or a remote viewing, but if you plan on transferring files, the viewing portion has to be already opened. Using this software is a breeze. The tool is particularly effective for spontaneous remote support, but it works well for any other types of on-demand remote applications. The fact that it’s so lightweight (500KB file size) can be considered great news for those who need a quick remote access solution. Even if you haven’t yet seen the screen of the connected PC, the text and voice chat features are available. This means you can just use this tool like a basic VOIP or chat program before getting into the screen sharing features. When you transfer files with this software, you can check the convenient log that’s generated for security reasons. That’s a really basic feature that’s incredibly useful and not found on other similar programs. The screen recording works well, but the remote sessions are saved in a strange PRS format which can be difficult to open with other media players apart from the built-in one in the tool. All in all, Secreen has few disadvantages and a reasonably comprehensive list of solid features. Those who need fast on-demand remote support shouldn’t miss out on such a well-designed little program. Did you find our article helpful? Then you might also be interested in our articles about How to Fix a Blue Screen of Death and How to Take a Screenshot on a PC.